Paul Nash was born in London in 1889, the elder brother of artist John Nash. Although predominantly a painter, Paul Nash was also a book illustrator, designer and writer. Nash was essentially a self-taught artist but did briefly study at the Slade School of Art. 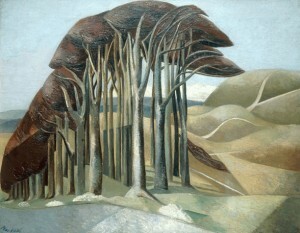 His first solo show was held at the Carfax Gallery in 1912 and one year later exhibited with the New English Art Club where Roger Fry reportedly said that he considered Nash’s work the best in the show. Nash later joined Roger Fry’s Omega Workshop in 1914. Nash was a commissioned officer during the First World War, later being appointed an Official War Artist. His work during this time reflected the carnage and devastation of war with typical twisted trees and destroyed landscapes. After moving to Dymchurch in Kent in 1919 Nash began producing wood-engravings, which became a recurring medium throughout the 1920s resulting in a retrospective exhibition at the Redfern Gallery in 1928. Around the same time he began to incorporate surreal elements in his work, later becoming a founding member of the British group of artists called Unit One who pioneered surrealist and abstract art. The influence of surrealism continued in Nash’s work throughout the rest of his career, best depicted in one of his most famous paintings Totes Meer produced between 1940-41 during World War II.